RIGEL & BETELGEUSE is the story of a singular pair that come from nowhere, one of whom is destined by fate to depart. They are two characters that emerge from an unknown canvas and are driven into a new painting, this one executed by the outdoor place, which will be invested. The original intention of RIGEL & BETELGEUSE was to create a vivid duet with a script adaptable to any number of performance spaces. Emmanuel Jouthe has therefore selected some of the trademark characteristics of his choreographic signature and has created a “danse-poursuite” for two performers emphasizing the implausible life of a duo. 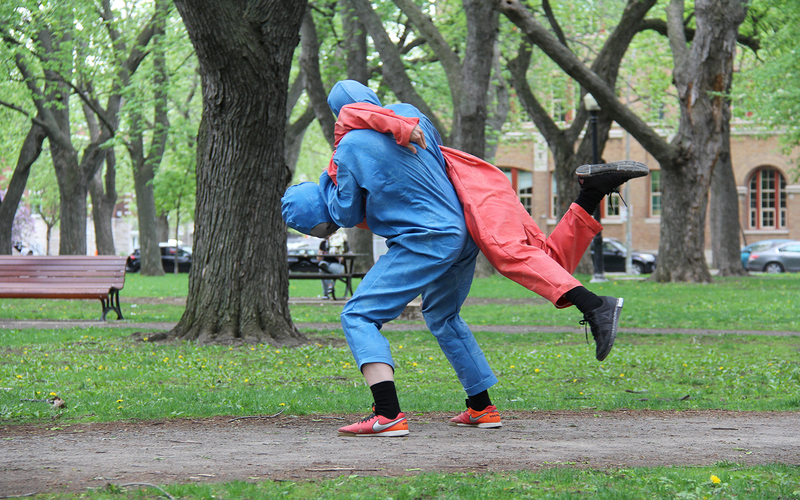 Depersonalized by their costumes, with each fresh performance the dancers dive into a completely new dialogue, a direct conversation articulated around a theme, a portfolio of movements, an alphabet of constraints and physical situations, in surroundings that change with every performance. The lively characteristics of this unusual duo are directly related to their costumes. Initially inspired by Magritte’s painting Les Amants, the costumes were eventually designed with the goal of erasing the uniqueness of the individual in order to better evoke a universal and non-gendered atmosphere with which everyone can identify. Among other things, the characters’ hidden aspect allows the two dancers to play their game of hide-and-seek and tag without knowing who’s who. In turn, the show’s script and improvised gestures are coloured by the distinctive characteristics of certain aesthetic movements in painting: fauvism, cubism, and pointillism. Combined with the explosive and percussive character of the dancers, these pictorial influences facilitate the performance of otherwise-complex curves, lines, and postures which outline exaggerated movements, while the juxtaposition and repetition of gestures enable variations on a single image.